Over the past week, I was talking to a senior at one of our area’s super-competitive high schools. The young woman had survived AP classes and the fraught college admissions process to win a place at both UC Berkeley and UCLA – among the most selective public universities in the United States. But the story she wanted to tell had nothing to do with pride of accomplishment. Rather, this Pleasanton senior wanted to share her observations of the intensely pathological nature of academic competition and the college admissions process. She was disturbed by how physically and emotionally sick her classmates, particularly those in Advanced Placement courses, have become over test anxiety and homework loads. She admitted that she was on an anti-depressant and stated that most kids in her AP classes were on some kind of medication for stress, anxiety or attention disorders. “It shouldn’t be this way,” she said. But apparently it is. Kids in the East Bay suburbs go to schools dominated by a culture of testing, which may have little to do with teaching kids how to think critically and to grow into decent, happy human beings. The testing culture, which has become big business in America, has worked its way into our schools and largely defined the education our kids receive, starting from second grade, according to many teachers I have spoken with, as well as experts on the national level. This Pleasanton senior’s complaint came a week after I heard a similar lament from a young German student named Melchior. A gifted student, seemingly destined for a bright, professional future, Melchior explained his dismay by what was being taught in his well-regarded secondary school. He calls education a “parentocracy,” in which adults view children as blank slates needing to be filled. Melchior’s classes may introduce him to Latin and classic works of literature but the teaching methods involve rote recitation of facts, which students must be spit out on make-or-break tests that essentially determine their future careers and the rest of their lives. Independent, critical thinking is discouraged. OK, Melchior is not a real person, but the fictional hero of Spring Awakening, a hard-hitting Tony Award-winning rock musical set in Germany in the 1890s. Walnut Creek’s Center REPertory Company is presenting this daring musical about a group of teens coming of age. The show continues through May 13 at the Lesher Center for the Arts. 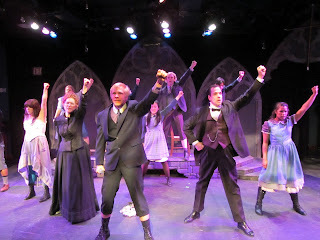 Much of what you hear about Spring Awakening, based on a banned 1891 play by Franz Wedekind, focuses on its sexual themes. It depicts of group of provincial school kids struggling with their sudden awareness of sexual feelings and of how the adult world is painfully flawed. Repressed and frightened adults, and the business-industrial education system that schools them, fail to give these male and female students information that is really crucial to their ability to think for themselves and to make important life-and-death decisions. Melchior has been dipping into the Nietzsche and other radical thinkers of the late 1800s. He proclaims that God is dead and seriously questions the ideological underpinnings of his nation's religion, culture, morality and education system. He also sees his good friend Moritz struggling with a horrendous homework load that is, literally, driving this sensitive young man crazy. Moritz will be up all night cramming for tests, but his galloping mind, racing with hormones and new ideas, interrupts his focus. The sorrows of young Moritz offer a strong example of how Spring Awakening’s depiction of Germany’s 1890s education industrial complex is not so different from what many say America has in place in 2012. It’s interesting to note that the United States owes some of its philosophical and structural ideas about public education to 18th and 19th century German reformers. Even before then, Martin Luther advocated for compulsory schooling so that all citizens would be able to read and interpret the Bible. In the 18th century, the Kingdom of Prussia was one of the first countries in the world to introduce the idea of free basic, primary education that would teach skills for a newly industrialized work force. School also needed to provide students with a moral education, to turn out disciplined and obedient citizens who would help advance the nation’s progress in Europe and on the world stage. In the first decade of the 21st century, many American educators and scholars have watched in puzzlement at what’s happened to our American education system, notably after the federal No Child Left Behind was enacted in 2001, ostensibly to improve schools and make them and teachers more accountable. Among the unintended consequences of No Child Left Behind has been the “shrinkage of time available to teach anything other than reading and math,” wrote renowned education scholar Diane Ravitch in an article "Stop the Madness" on the National Education Association website. The documentary film Race to Nowhere, by Lafayette filmmaker Vicki Abeles, similarly critiques our out-of-balance education culture. Since its release in 2009, Race to Nowhere has been screened in communities throughout the country and prompted schools and school districts to adopt new policies surrounding homework loads and easing student stress. Although Melchior aces his examinations in school, he is disengaged by what he had to learn for the tests. Meanwhile, his friend, Moritz is a walking nervous breakdown. If Moritz doesn’t score high enough on his exams, he won’t be able to advance to the next level of school. If he fails, he knows he will bring great shame to his family, particularly to his father who has told him he won't be able to show his face at work. Moritz makes a desperate, final choice that has tragic consequences. Abeles says her desire to make her film gained momentum after the suicide of a 13-year-old Danville girl in 2008. Apparently, this bright, outwardly happy and successful middle school student committed suicide after receiving a poor grade on a math test. The Pleasanton high school senior I talked to said she has likewise known classmates who have become despondent over poor grades on tests. One, she said, attempted suicide after receiving a B on an AP test. As this girl said before, “It shouldn’t be this way.” Works like Spring Awakening – timeless in its themes despite its old European setting – or new films like Race to Nowhere help illuminate this young woman’s point: it shouldn't be this way. Martha..It's been awhile since I last checked-in with Crazy. I miss your writing and your perspective. As a parent of a recent UC Davis graduate, and a 2nd year student at AU in DC, I have felt, for years, despite the more moderate culture at Las Lomas, that parents in our area typically put tremendous pressure and pre-packaged expectations on our students. Thanks Don for sharing your perspective. Hi Martha. I'm going to see the play this Sunday. I got one of the last two tickets. I'm worried about all the pressure on kids in this area, but it's also in sports and extra-curricular activities as well. I know 8-year-olds who have a busier schedule than most adults. We have to schedule time in advance for my son to play with them. It's crazy all right.